The BOSS GT-1000 Guitar Effects Processor is the next stage in BOSS' amp/effects processing evolution. Introducing BOSS' ground-breaking AIRD (Augmented Impulse Response Dynamics) technology, the GT-1000 benefits from a wealth of experience combined with bleeding-edge tech to create an exceptional unit that puts total creative control at your feet. The BOSS GT-1000 boasts the first-ever guitar multi FX unit equipped with 32-bit AD/DA, 32-bit floating-point processing, and 96kHz sampling rate for peerless accuracy. The newly built Digital Signal Processing (DSP) engine is three times as powerful as before and is specially designed for audio and music applications. The increased power means that finer detail within the tones you create can be focused and refined with greater ease. The GT-1000 boasts BOSS' AIRD technology, which borrows from their Tube Logic concept (as seen across KATANA, Waza, and Blues Cube amps) to heighten the built-in amp processor's performance. The subtle nuances of a tube amp's character are recreated with stunning efficacy. Focusing on the special relationship between amp and speaker, the breadth and depth of each amp's dynamics are beautifully translated. From the wide range of amplifiers available, you can tweak each one to achieve the amp sound of your dreams. Another outstanding feature of AIRD is in its ability to allow the GT-1000 to merge seamlessly with any audio equipment. Whether you're integrating the unit into a highly complex stage- or studio-setup, or simply going from guitar to GT-1000 to amp, you have a plethora of connections that all feature independent ground lift functions to remove any unwanted hum issues for pristine signal fidelity. The GT-1000 bears the BOSS name proudly and is well equipped with a vast selection of effects, many of which utilise BOSS' Multi-Dimensional Processing (MDP) tech for intelligent dynamic control. Borrowing advanced algorithms for BOSS' DD-/MD-/RV- 500 units, as well as sophisticated Acoustic Resonance for electro-acoustic performance, you can rest assured that immaculate effects await you. 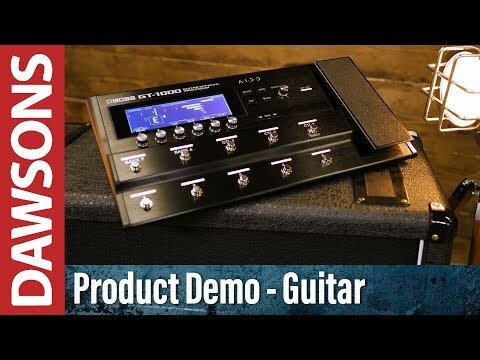 As we've come to expect from the team at BOSS, the GT-1000 Guitar Effects Processor is built like a tank, and ready for action straight out of the box. The controller interface is uncluttered, whilst the overall size is delightfully compact. The newly developed low-profile footswitches reduce size and weight but retain the same responsiveness and durability we know and love. The GT-1000 has an ample display screen, which allows sounds to be created and adjusted easily. Whether you're setting up individual effects, amp settings, creating chains, or changing order, everything is displayed in an easy to read manner for a smooth workflow. There's an impressive ten footswitches and an expression pedal with toe switch to use. But should you wish to, control can be expanded further via external switches, pedals, MIDI, and USB. The footswitches can all be reassigned to control any function you desire, allowing you to completely customize the unit. The BOSS GT-1000 has built-in Bluetooth connectivity, which enables your smartphone or tablet to get involved by managing sounds using BOSS' Tone Studio app for iOS and Android. You can edit and adjust your sounds without having touch the GT-1000 directly. You can even record and play a loop, then listen to it back whilst wandering the venue, making tonal adjustments on the fly. There is even a built-in USB audio/MIDI interface with multi-channel audio recording support, as well as efficient re-amping. If you don't fancy going wireless, you can use the USB to access the desktop version of the BOSS Tone Studio Editor for Mac and Windows. The BOSS GT-1000 Guitar Effects Processor is an outstanding unit, which has everything that you could want - and more!